Stardust ARC. It’s a book that has been with the fundraiser since 2008…. 2008: A Gift from Gaiman. 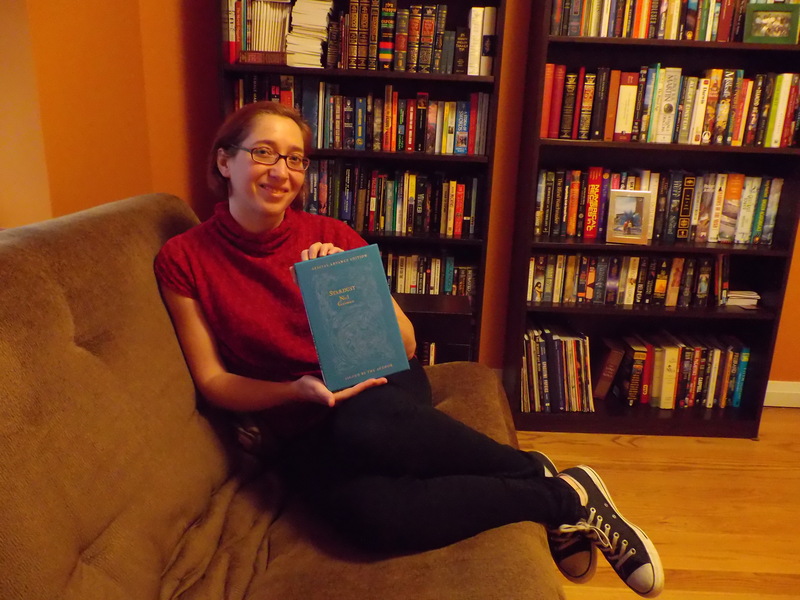 In 2008 I was still a newbie author, barely published for a year. On a whim, I decided to try raising money for Heifer International on my blog. As you can guess, things quickly spiraled out of control as other authors pitched in, helping spread the word and donating books for us to give away. The pinnacle of the coolness/madness came when Neil Gaiman mentioned us to his vast legion of readers. He also donated a rare ARC of Stardust to the cause. Unfortunately, mail was delayed because of the holidays, so we couldn’t use the book until…. 2009: Stardust for the People. So we had this book. This beautiful book. This beautiful, *rare* book. And I was having a hard time deciding how best to use it. I knew we could auction it off and raise at least a thousand dollars, maybe a couple thousand, but that didn’t seem right somehow. So I decided to put it into the lottery, where anyone who donated to Heifer International on our team page would have a chance at winning it. That seemed fair to me, more egalitarian. But then something strange happened. At the end of the fundraiser the person who won the book gave it back to us. Their one stipulation is that we auction it off next year, so it will bring in more money for Heifer. So…. 2010: Stardust on the Auction Block. During year three of Worldbuilders, we auctioned off all manner of things. 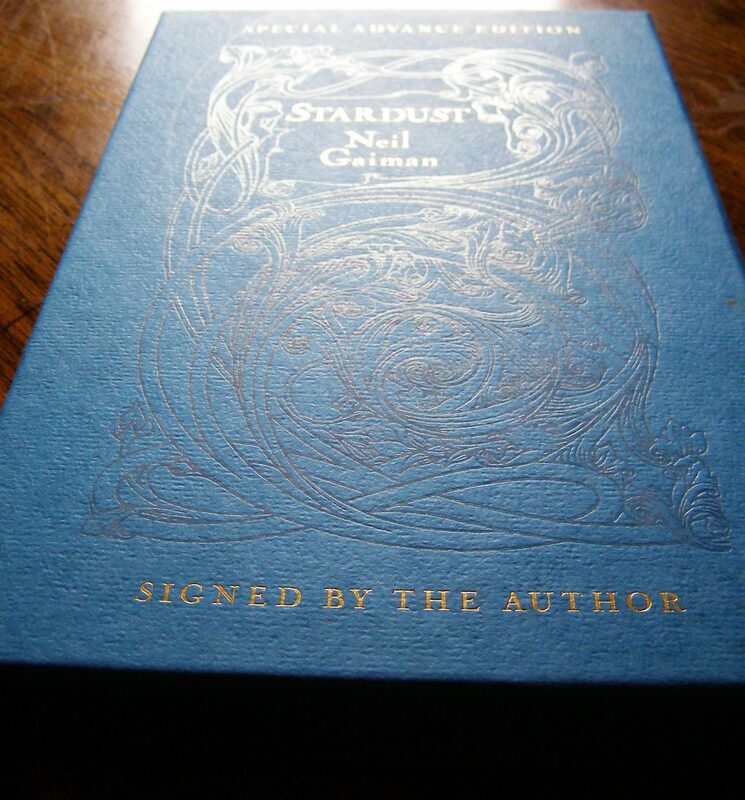 And, as the previous winner requested, we put Gaiman’s Stardust ARC up on eBay too. After some fierce bidding it sold for over $2500 to a lovely guy named Dan. There were many high-fives in Worldbuilders central. We were sad to see the book go, but $2500 bucks buys a lot of goats. 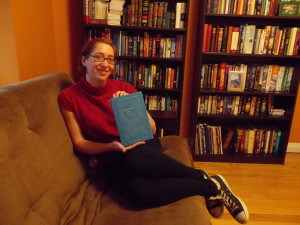 But when I e-mailed Dan to arrange shipping, he said he wanted to donate the book back to Worldbuilders. I asked Dan if he was sure. He said he was sure. I asked Dan how he got to be so cool, and he said he was inspired by the story of how last year’s winner re-donated the book. From everything I’ve heard, she sounds like my kind of lady. Dan told me she had passed away recently, and that most of the money he inherited from her went into buying this book. He thinks she would be proud and happy to know that the money will go to helping as many people as possible through Heifer. Dan also said that he was a big Gaiman fan, and that he hoped that this whole exchange didn’t give Gaiman a complex because nobody would keep his book…. His only stipulation was that we put the book back into the lottery next year, so anyone can win it…. We put the ARC back into the lottery with much cheering. After picking the prizes, I called the winner, Maayan, to set up shipping (because you don’t want something like this to be a surprise on a doorstep). Maayan tells me no. She wants it back in the fundraiser. It’s sort of a thing now. I send her a box of books as a “Thanks for being cool” present. 2012: Stardust as Statistical Anomaly. In 2012, we put Stardust back in the lottery again. Mostly because I like the idea of this amazingly cool prize being something anyone can win. At the end of the fundraiser, we run our numbers. We cross-reference our list of prizes with our list of winners. Amanda ran through the house yelling, after she checked it three times. When I’m told, I look at the assistant holding the handful of papers with grim, fatherly disapproval, telling them in the gentlest of terms that they’ve fucked up and are obviously using last year’s spreadsheets. But no. The truth is, Maayan won it *again*. For the second year in row. This is bizarre math, people. This is like Heart-of-Gold level improbability. I called her. She was shocked, amused, and flustered. So we sent her the book. And she sent us back a picture. I was really extremely surprised to win the Stardust ARC two years ago, because I don’t think I’ve ever won any kind of online contest before. I was actually sitting in a hot tub on a ski trip to Colorado when Pat called, and my friends got to watch me make the craziest faces while on the phone. 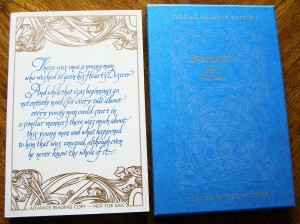 A few weeks later, Neil Gaiman sent me a little card with a picture he had drawn in it, which was so nice of him. When Pat called me this year to say that I had won again, I’m pretty sure my first words were, “No, I did not!” Surprised doesn’t begin to describe it. If I win again this year, I’m going to start to be suspicious of your randomization algorithm. Worldbuilders is such a great fundraiser, and Heifer International is an outstanding organization. I’m thrilled to take part. Thank you to Pat Rothfuss for putting it together, and thank you to all of the authors and artists who donate the prizes! I’ve enjoyed reading the fruits of your generosity. That’s right, Maayan sent it back to us again. Thanks so much, Maayan. We’re glad you at least got to touch the book that seems so desperate to meet you. And without further ado, we’re putting it back in the lottery. 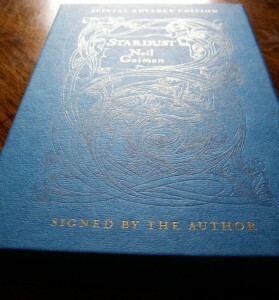 A numbered, limited edition ARC of Stardust in its own slipcase. 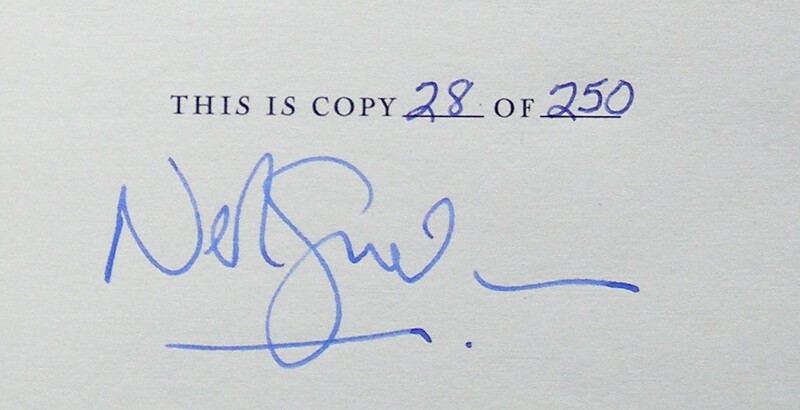 Signed by Neil Gaiman. Not much remains to be said here. 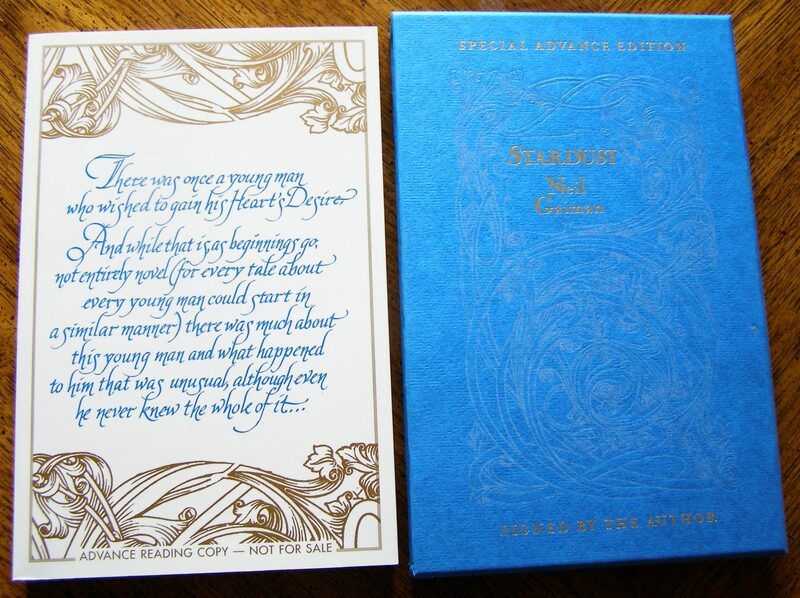 It’s a beautiful book with its own slipcase. Numbered 28 out of 250. Signed by Gaiman. If you donate to Heifer International on our team page, you have a chance of winning not only this book, but hundreds upon hundreds of other books donated by other authors, publishers, collectors and fans. If you’d like to see some of the auctions we’re running, you can head over to our eBay page.